Matriculation passed or its equivalent from a recognised board or university. Two years Diploma certificate in Draughtsmanship from an ITI or recognised institute. Three years experience from a drawing or design office in the field of Mechanical/ Naval Architecture/ Electrical Engineering. How to Apply: Application in the prescribed format should be send with in 28 days of the publication o the (Published on 30/07/2016), i.e. the last date is 27/08/2016. 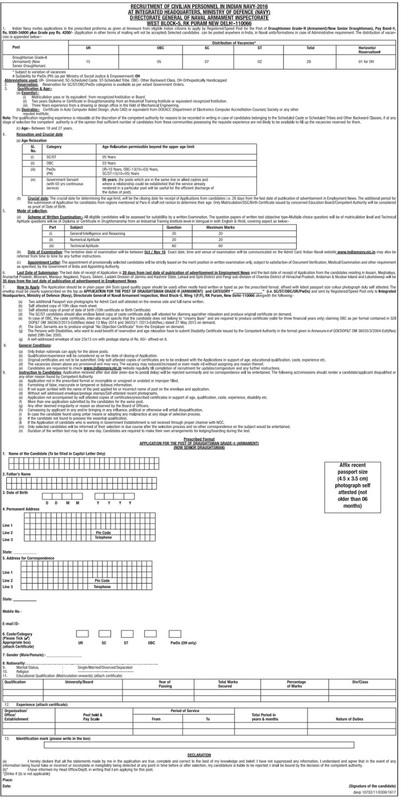 For Details and application format, please visit http://www.indiannavy.nic.in or please see Employment News dated 30th July 2016 page no. 23 ad 25 and See here .